Yesterday marked the start of VMworld US, kicked off as usual by the keynote presentation covering VMware’s vision for the future and that of the industry. If you missed the keynote I would highly recommend that you watch the recording below. 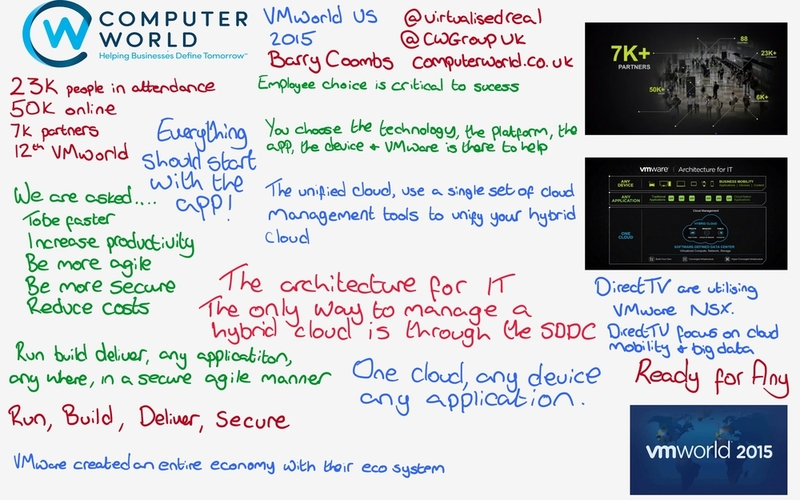 ComputerWorld’s director and vExpert covered the event live on twitter with his live doodles as can been seen below. VMware have spoke about their devision of “One Cloud, Any Application, Any Device”, claiming that they uniquely span mobile, desktop and infrastructure to support innovative business strategies while protecting intellectual property, data and business operations. You can read more about this on VMware’s dedicated site or hear from Pat Gelsinger below. VMware are looking to unify your cloud across private and public offerings with a unified management layer allowing you seamless management, automation and orchestration using the tools you are already utilising today. To this end VMware demonstrated cross cloud vMotion for the first time live on stage. 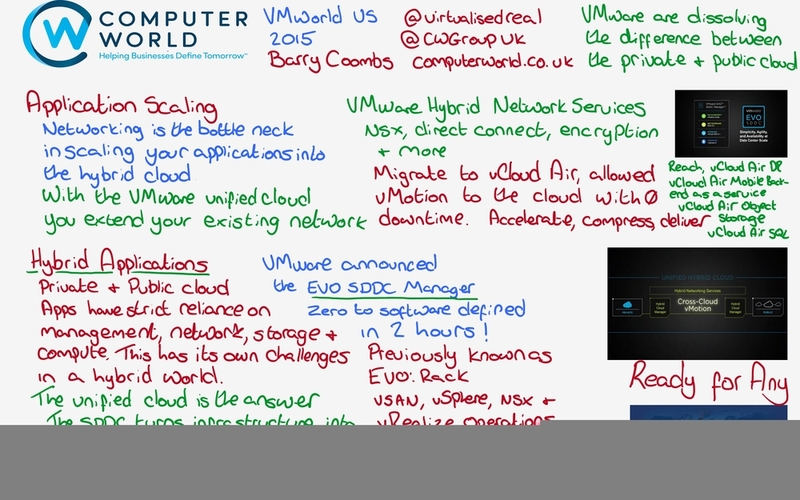 VMworld US keynote 2015 – Watch VMware's vision for the future. VMware CEO, Pat Gelsinger discusses how IT is changing because business is changing. The focus is increasingly on the applications and not on the infrastructure, there is no greater example of this as there is were Docker and Containers. VMware have been working hard to ensure containers are a first class citizen with their solutions, the first solution is to this end is vSphere Integrated Containers, allowing visibility of your application containers from inside vSphere, unlike today where several containers maybe contained insider a container host but be transparent to vSphere itself. The second solution is a container centric solution known as the Photon Platform, made up of two components the Photon Machine a micro-visor based upon ESXi and including VMware’s lightweight Photon OS and the Photon Controller, a distributed, multi-pennant control plan giving you a single point API endpoint for managing your container architecture. 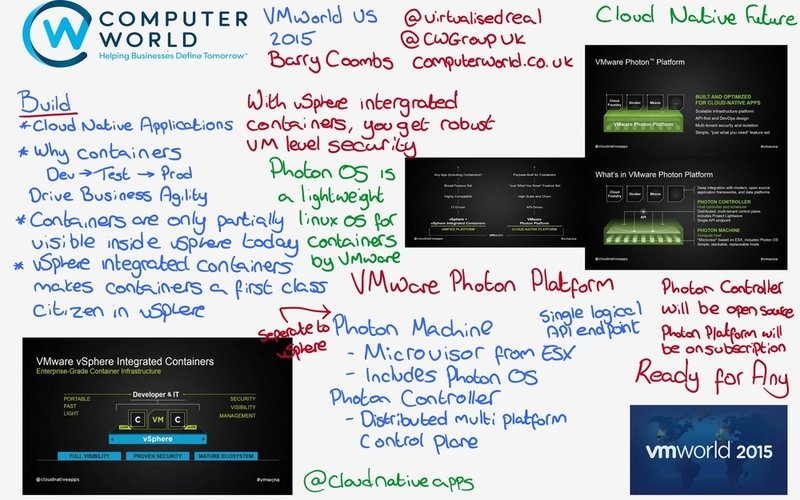 ComputerWorld has hand picked the links below for further reading on these subjects and others discussed during the first day at VMworld 2015. Chris Wolf (Americas CTO) VMworld 2015: The End of the Beginning — Let’s Go! !